In today’s tutorial, I would like to share about a Step by Step procedure to apply for Google AdSense. Also, read Get AdSense Approval guide before you apply for Google AdSense.If you want to apply Google AdSense for a new domain or existing domain with less than 6 months or above, just follow these steps to apply for an AdSense account. 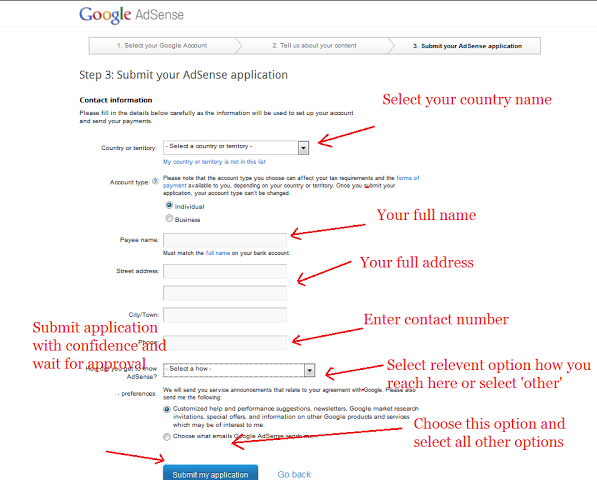 To apply for Google Adsense all you need to do this to follow the Steps as follows. Open Google AdSense official link. Click on ” Get Started Now “. For reference just see the image as follows. 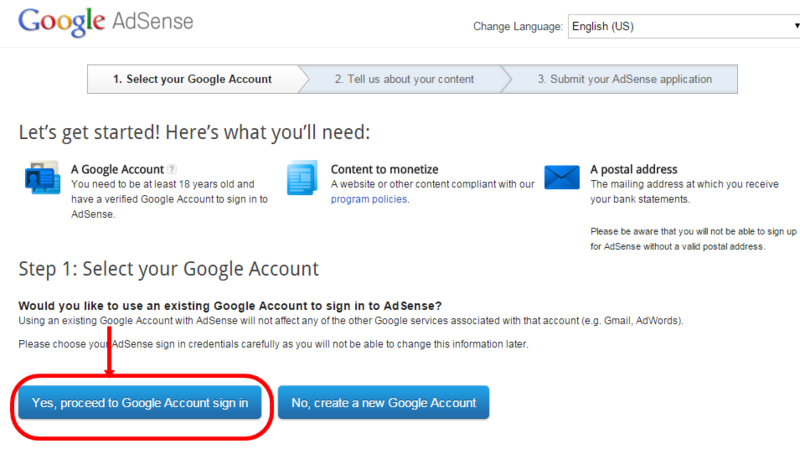 Click on the “ Yes, Proceed to Google Account Sign in” as shown in the image as follows. I always suggest you create a new account for Google AdSense and apply from the new Gmail account. If you have already created a new Gmail account then, enter your new Gmail ID and password and then click on “Sign in“. If you haven’t created a new Gmail account then create it now and Sign in. I have logged in with New account that is specially created for AdSense account. After logging into the AdSense account, fill the form with the required data. 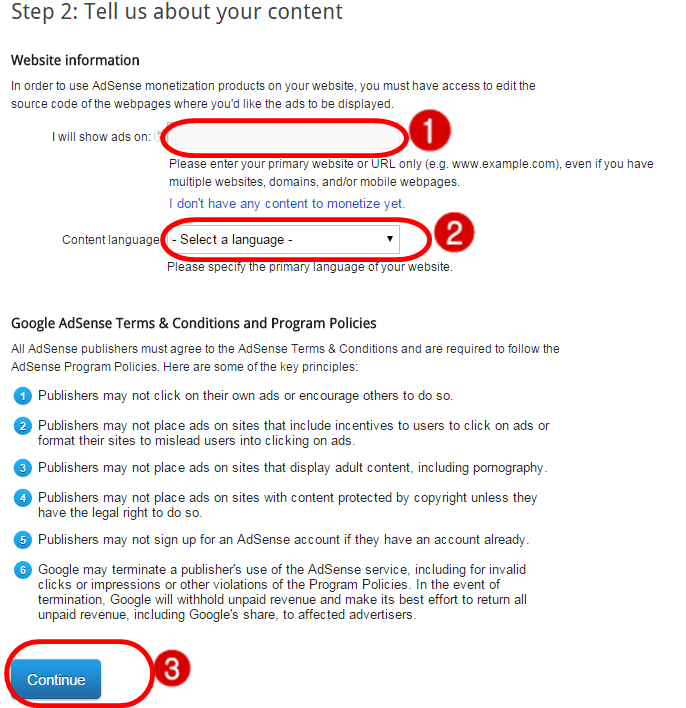 This is the Last step for Applying for Google AdSense. Fill the form with correct details without any confusion. That’s all. 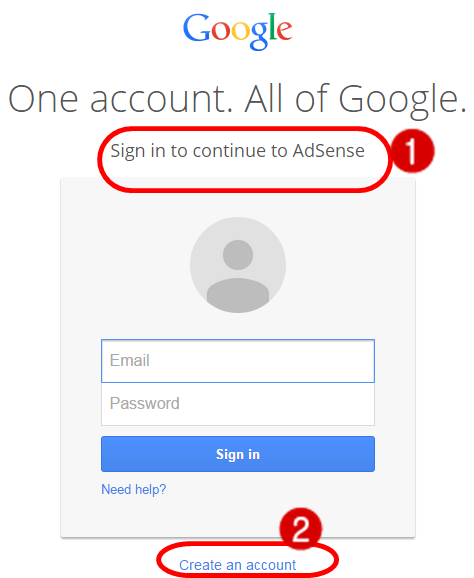 You are done with the applying for Google AdSense account. Then you have to wait for the approval mail and check your mail frequently till you get an Email from Google. If you face any problems regarding AdSense approval, Applying for Adsense, etc. Let me know in your comments. If you have any issues with your AdSense account, let us know in the below comments. We will try to solve your queries regarding AdSense. Hi Lasya, Thanks for the info. I am glad I came across your website. It seems it has everything I wanted to start a new blog. I have a doubt regarding content. Lets say I want to write some X topic, I am sure that will be presented on the web.for ex: Tutorial. Now, will that be duplicate content. What If I can write in my own way without exactly copy paste the content. Will that work. Please help me. Thanks! Lasya for the information. My question is why we need to create new account for Adsense , can I use my current blogger account for applying.? For security reasons you should do with new id. Current id may be known to many but adsense id will not be shared with any. So, theft of your id will not happen. Account and money will be safe. Thank you Lasya for the article. But am having problems with getting adsense account approved.. Thank you so much for your great help, i want to learn before applying for adsense and i got much help from your article. My account unchecked 10 days . Hello there! I want to ask u that why I am not getting approval for my website? I have added the private policy, contact us and about us page and have enough content data on my website. See that your site has quick navigation, responsiveness, non-copied content and niche of your site is very important. If your site is qualified with all these requirements then you will get approval from AdSense team. I have tried to link my youtube channel to google adsense but i cant proceed after step 2.i have tried several times but end up with the same thing.Do you know why its happening ? google news me site ko kese sumit karte hai. I read your article about google ad-sense for create account. i will use your google adsense tips. Hey Lasya ! Great tutorial for educating the newbies to get their google adsense account approved, Your article is quite descriptive and explain all the procedure step by step to make the task easy. Thanks for such an informative and worthy article. if i publish my website using google adwords to get more traffic by organic. is google will approve adsense account to my website if i apply. Traffic is not much required for Google AdSense approval. You can apply when your blog is ready and should pass all the requirements. It may take 3 days to 1 week. I am Roop Kumar, i have a google blogspot site, in that i am kept some YouTube links (which are not created by me but others) which are related to my articles. Now i want apply for google adsense. is their any problem with YouTube links? or have to remove before applying to adsense? And last my blogger template have only one add banner that to in header. is their any problem? Please rly. That is not an issue of using others YouTube videos. But, give video credits or source at the end of the video. Yes, we can apply for Google AdSense on the new blog, but the only requirement is the domain age should be minimum 45-2 months old. Make sure that your domain is of at least 45 days old. Here [email protected] is the same email id which I used to login. Is there any problem with this kind of pop up message ? No issues. You can go on with the legal AdSense account, which is genuinely approved for your website. Thank you Lasya for your quick response.